Penny Blacks & Adam Mowery V-day Show! Penny Blacks and Adam Mowery bring Valentine’s Extravaganza Back to Port City for Thrilling Fourth Year! Attention swingers, lovers, cool cats, rebels, guys, dolls and pasty wallflowers! 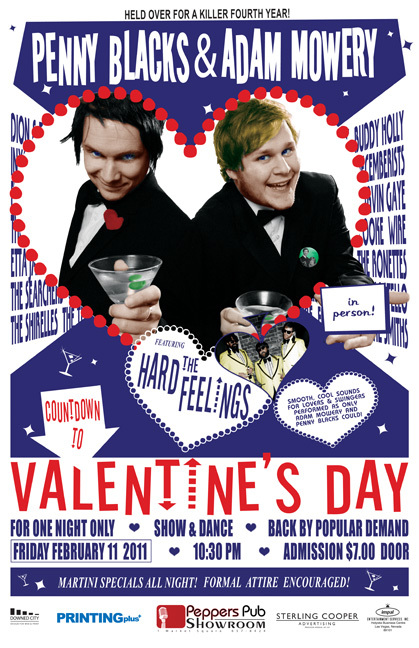 Throw on a necktie, or tiara, and get yourselves primed for Saint Valentine in style by heading to Peppers to prepare for V-Day with some cocktails and smooth, cool sounds for lovers, performed as only Adam Mowery and Penny Blacks could! It’s no secret that Blacks and Mowery are hot commodities, especially during the season of lovers. This powerhouse duo of charm, talent and – let’s face it – just pure, good old-fashioned showmanship are in high demand everywhere from the Hamptons to the Vegas Strip. But they turned down every offer, every plea, every court-enforced dictum in order to return to the glittering diamond tip of New Brunswick’s industrial drill press, Saint John. What can you expect from the hottest Valentine’s weekend ticket this side of Atlantic City? The evening will kick off with a set of heart-bustin’ croonin’ by Mr. Penny Blacks, followed by a swoon-inducing performance by Mr. Adam Mowery. At this point, you might think that you have gotten your money’s worth already. But no, the entertainment doesn’t stop there! Mr. Blacks and Mowery will cap the evening with a final return to the stage TOGETHER, for a show-stopping set of “Covers for Lovers,” backed by the legendary HARD FEELINGS! Last year, the act’s thrilling repertoire ran the gamut from the likes of Frankie Valli and Dion to Wire and Roxette. It’s a Rat Pack/Vegas theme, so don’t be afraid to put on that jacket and tie, or that sassy little cocktail dress! The event takes place at Peppers Pub, 1 Market Square, on Friday, February 11. Showtime: 10:30 PM. Admission: $7 at the door. Entry filed under: Arts Community, City Life, Local Music. Tags: Adam Mowery, Hard Feelings, Market Square, Penny Blacks, Pepper's Pub, Rat Pack Theme, Valentine`s Day.